Remember when we told you that Microsoft is preparing third-party extensions support for Microsoft Edge, when we were writing about AdBlock Plus for Windows 10’s browser? 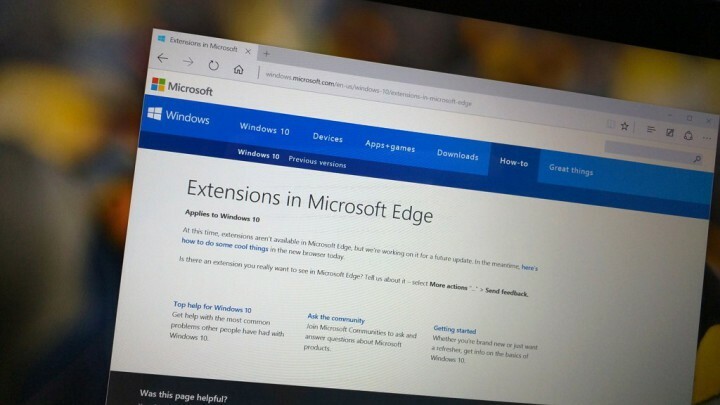 Turns out, we were right, extensions support is coming to Microsoft Edge! The very first Redstone Build for Windows 10 Preview was released today, and even if Microsoft didn’t officially announce any new features (but we know the issues), some info has leaked online, that Microsoft is already testing the support for third-party extensions internally, and it will deliver it to users in coming weeks. We have this leak from Twitter user @h0x0d, who also noted that there are several registry entries for this feature in build 11082. Since there are some new registry entries, the extensions menu can be already added to Microsoft Edge, but it’s useless, since there are no extensions for Microsoft Edge, yet. Microsoft Edge Extensions to Come in the Next Redstone Build? To remind you, Microsoft Edge extensions support is planned for the final release of Redstone Update, in mid-2016, so if the predictions are true, only Insiders will be able to use extensions in Edge, and help Microsoft test and further improve this feature. There are a lot of unknown things about Windows 10 Redstone Update and its features, which is completely normal, because we probably have more than six months, and a lot of upcoming builds until the final release, so a lot much more will be cleaner in the future, for sure.